I love it! The twine from your Mom is such a special touch. The old and loved twine is a lovely touch to add to your wonderful design. The blues look great with the white and gray. Beautiful card. I love those polka dots. I am afraid to use texture paste. I love your melted bead. I just used three that I melted after hearing of yours. I love that you used something from your mom. I know she would be pleased. Lovely card and envelope. Wonderful design! Makes for a beauty! 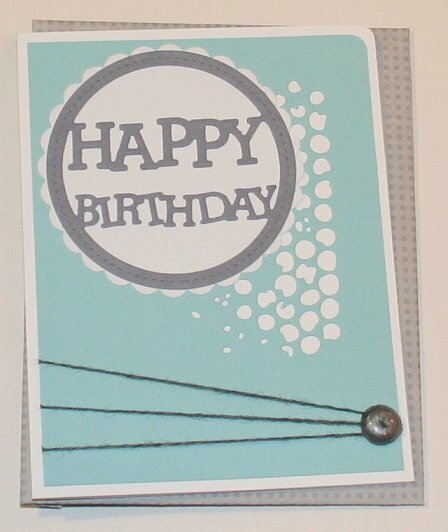 I love the twine on this and all of this white dots! Great card Ro! Beautiful - love the colors and overall design; your bead/thread accent is amazing!!!! Great design! Love the fiber! Ro you rocked this. Love that background you got!! Great design too with the twine coming out like that. The bead and twine look lovely together. I tired melting a bead once but it did not come out as nice as yours. Love how you used the birthday die and the blue BG. The cord with your melted beads is excellent addition. Pretty colors ...love the twine ! Love the style of this card!